Faculty and staff members who embrace diversity and inclusion in their positions and across campus were honored with the inaugural Diversity and Inclusion Awards at an April 3 ceremony. The university’s core strategy for diversity includes three parts: reflect, engage and learn. 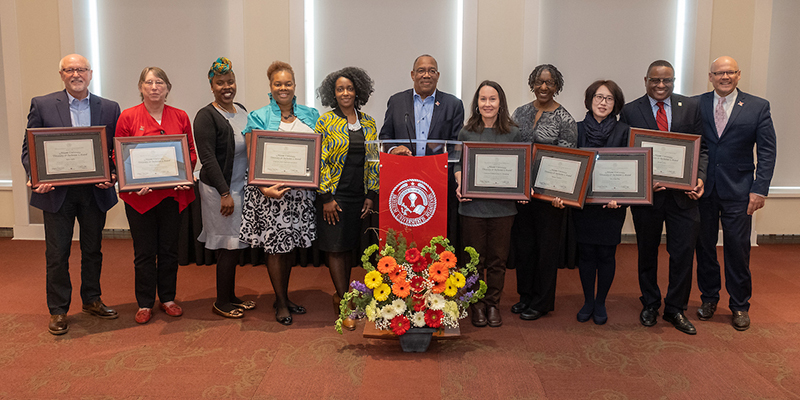 Ron Scott, vice president for Institutional Diversity and Inclusion, presented seven awards that fell within three categories: Institutional Excellence, Distinguished Service and Ray of Light. The award recognizes members of the Miami community who have made significant/outstanding contributions to the university in the area of diversity and inclusion. These individuals have demonstrated, advanced or promoted activities, programs, or actions that have supported campus efforts to help enrich the experiences for faculty, staff and students at the university. “They are rays of light that show us the way and model the behavior that illuminates our values,” Scott said. Yang serves as the associate director of American Culture and English (ACE) on campus, which helps international students acclimate with American culture and language. Yang also serves as the founder and president of the International Faculty Staff Association at Miami University (IFSAM), a new organization devoted to issues of international diversity at Miami. She has organized two faculty learning communities for international and graduate students and leads IFSAM members in important events that ensure representation of students and faculty across campus. She also is an active member of the Council for Diversity and Inclusion. These three women play important roles in the center’s diversity initiatives program, which encourages career support and coordination for underrepresented and underserved students. Howard serves as associate director of the initiatives program, Nalls as program coordinator and Smith as assistant director. Not only has the career center worked toward creating a professional space where people of all backgrounds can feel comfortable expressing their goals, but they have also launched a professional development series. They are involved in the Diversity and Inclusion Institute where employers, Miami scholars and leading professionals share their best practices and experiences. Hamilton serves as regional director for the Regionals’ Diversity and Multicultural Services and Title IX coordinator. Under her leadership, this branch has been dedicated to providing a supportive atmosphere for students, faculty, staff and local community members about diverse issues. From the ongoing Racial Legacy Series to the topic of the month conversations, to artists, performers and scholars that consistently appear on campus, Hamilton and her team have worked hard to make sure there is free and open dialogue across perspectives. Recently retired as director of institutional research, Krallman was a formidable force for the university and the One Miami Campus Climate Survey from the start of the process and the signing of the contract to the final revisions on the document. “Without the incalculable hours she and her team put into developing the survey, Miami would not have been able to complete the project,” Scott said. This award recognizes those whose leadership contributions have directly enhanced and modeled qualities that have led to greater diversity and inclusion on campus or in their field. Conley and his fellow staff members have been eager proponents of diversity through library read-ins, where members of the community are encouraged to actively participate in the celebration and understanding of different ethnic groups, genders, sexual orientations, abilities, cultures and communities. Conley has ensured that the libraries are more than just a place of quiet solitude and isolated research but places to discuss and share diverse topics and experiences. Throughout his career at Miami, Keller has created spaces where everyone can experience and understand the journey of those who came before us. As an architect, Keller set out to design the Freedom Summer Memorial in proximity to Peabody Hall and Kumler Chapel for educational and spiritual properties. The design concept was created to not only represent past social change, but also present and future. Keller was also responsible for designing the Armstrong Student Center seal, the Western College Legacy Circle and the Alumni Veterans Tribute. This award recognizes the creative/academic contributions of a unit steeped in a consistent record of service that has highlighted or supported diversity and inclusion on campus, or directly shaped and positively affected the meaning and understanding of diversity and inclusion on campus. UCM has consistently promoted the university through a wide range of mediums, while positively affecting the meaning and understanding of diversity and inclusion on campus. From news releases to magazine articles, photos to promotional videos or advertisements, websites to social media platforms, UCM has consistently affirmed the image of diversity and inclusion at Miami. Through UCM’s dedication in promoting Miami’s mission, from I Am Miami to the code of Love and Honor, “UCM never loses sight of the fact that there are groups out there who look to see if they are in the picture at Miami,” Scott said. “One such project is the redesign of the Diversity & Inclusion website. It is one of the most comprehensive diversity and inclusion college pages on the internet." Pictured above: Robert Keller, Denise Krallman, Shayna Smith, Kia Nalls, Tekeia Howard, Ron Scott, Jeri Moore (UCM), Bennyce Hamilton, Eun Chong Yang, Jerome Conley and President Crawford.